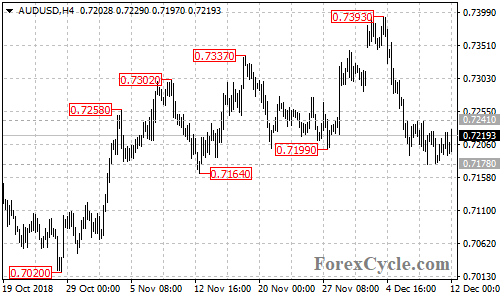 AUD/USD stays in a narrow range between 0.7178 and 0.7241. The price action in the range is likely consolidation for the downtrend from 0.7393. As long as 0.7241 resistance holds, the downside movement could be expected to resume, a breakdown below 0.7178 support could trigger further downside movement towards 0.7100. On the upside, a breakout of 0.7241 resistance could signal completion of the downtrend, then further rally to 0.7300 area could be seen.